The Galaxy S10 has already leaked out a few times this month, and now it’s popped its face out once again. Photos of the Samsung Galaxy S10 have leaked, giving us another look at the upcoming flagship and its hole-punch display. This model has just a single front camera in its hole-punch, suggesting that this is the standard Galaxy S10 model. 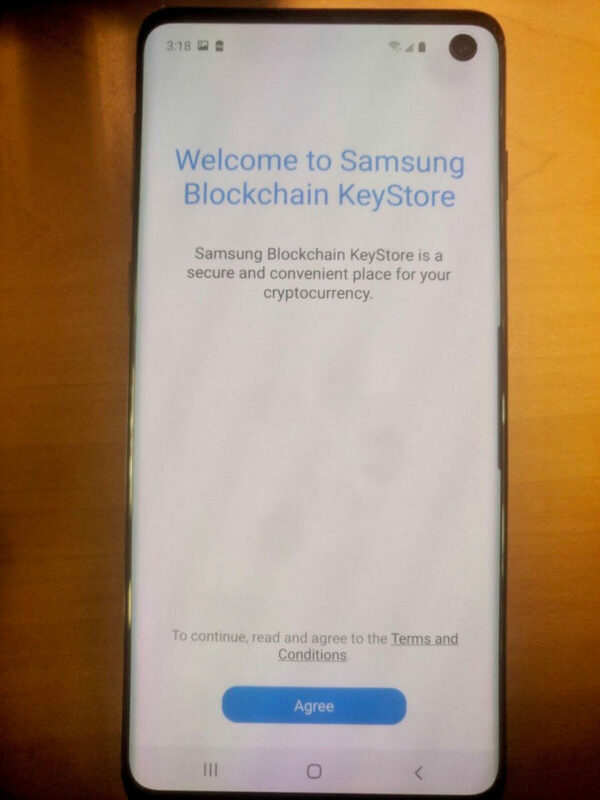 Today’s images also show a “Samsung Blockchain KeyStore”. According to the device, the app will offer a “secure and convenient place for your cryptocurrency”. The photos show that the app supports Ethereum (ETH), and in the phone’s settings we can see a way to “secure and manage your blockchain private key”. We’ve gotten a few looks at the Galaxy S10 and its hole-punch display lately, but these new photos give us a pretty good look at the screen and its front camera. The hole-punch is notable because it’s becoming a new trend in smartphones and because Samsung avoided the notch on its Galaxy S flagships, but it looks like the company will embrace the hole-punch with the S10, possibly as a way to further slim the bezels surrounding the screen. Also of note is the Samsung Blockchain KeyStore shown in these images. There haven’t been a ton of blockchain and cryptocurrency-focused phones and apps from major smartphone makers, though HTC did sell a blockchain-centric device last year. 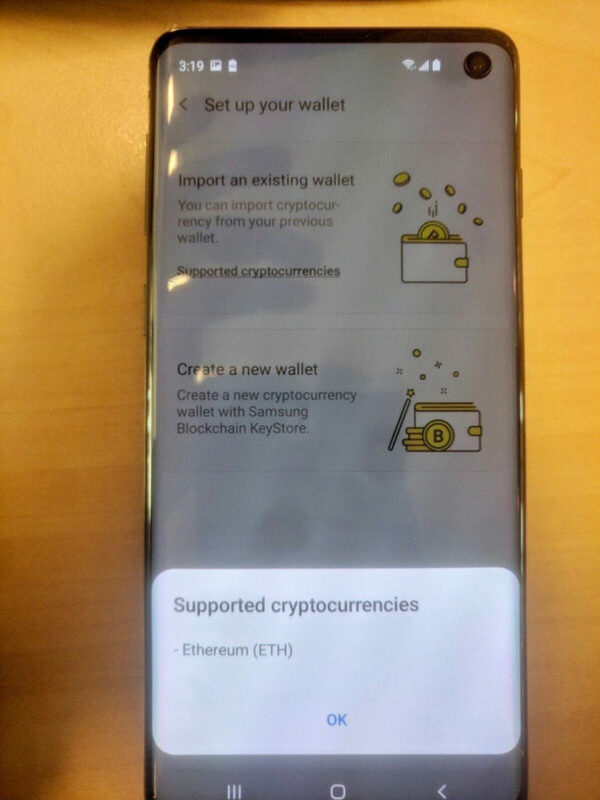 Now it appears that Samsung will be trying to get in on the trend and make its new phone a bit more appealing to those who are into cryptocurrency. What do you think of hole-punch displays like the one found on the Galaxy S10? No, I agree with you there. Personally, I don’t really mind the notch in the OnePlus 6T. They made it far less annoying and far smaller. But the hole punch thing is just awful. I’d imagine there’s some concerns with the screen’s backlight and such, but why can’t companies embed the camera directly into the screen, similar to how OnePlus integrated the fingerprint scanner behind the screen? Much less intrusive, much more screen real estate. Because cameras need a clear line of sight, while fingerprint scanners do not and it’s impossible to make a camera that resides on the surface of a screen. This is literally an apples to oranges comparison. Nah, I’m fine with it, people will get used to it. The notch (pixel, iphone) is much more intrusive imo. It’s not just you. It looks awful. I think that big banks and wall street helped bubble and bust block chain -and that set it back years from broader and wider acceptance in 2017. So It makes me think that Block chain wallet is rather foolish at this point as well as bad idea for other reasons. One if your phone is stolen or lost bricked or boot looped – I imagine that they key is gone forever unless you keep a back-up in a safety deposit box or safe. Also I don’t know any retailers that accept block chain in store – if the wallet is similar to the Samsung Pay wallet for CC, GC and membership cards. But Bitcoin was HUGE in Korea probably largest involvement of people per capita if any nation in 2017. I imagine that the security is the same as SD card encryption, secure folder data, that if not backed up – is gone forever or unreadable. would rather see Bixby deleted. Shame that they didn’t wait to delvop and use SD 845/855 VR/AI chip to drive Bixby rather a weak cloud based product. Probably because of the in house Exnos chip that ships to other parts of the world. Samsung should just go all in with either Snapdragon or their own chip -kinda of stupid and I’m sure its slowed roll out of OS and patches.